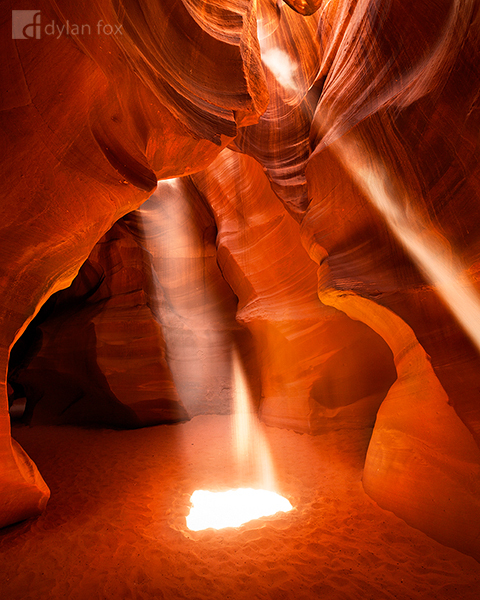 This photograph of Antelope Canyon captures the intense glowing colours created by the reflected light, red sand stone, and beautiful light beams making their way to the canyon floor. This was a place I had been keen to visit for years. I knew it would be stunning but as I walked into the slot canyon it really did take my breath away. It was even more stunning than I had imagined. Secure your limited edition, Antelope Canyon photographic print, 'Twins of Antelope Canyon', by selecting your desired print size in the menu to the right.